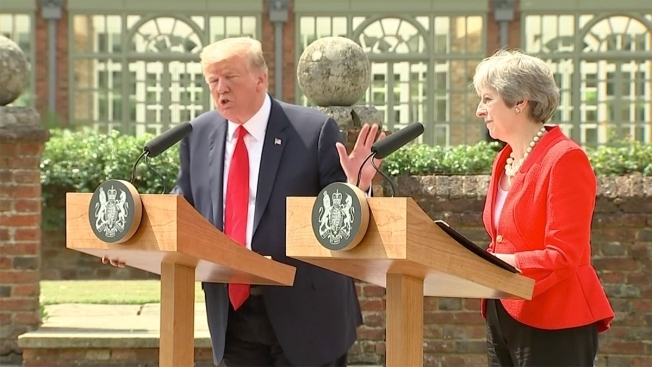 Trump, in an interview with the British newspaper The Sun, blamed immigration for a changing culture in Europe: "I think allowing millions and millions of people to come into Europe is very, very sad. I think you are losing your culture. Look around. You go through certain areas that didn't exist ten or 15 years ago." "I just think it's changing the culture. I think it's a very negative thing for Europe. I think it's very negative," he said. "I think it's very much hurt other parts of Europe. And I know it's politically not necessarily correct to say that, but I'll say it and I'll say it loud. And I think they better watch themselves because you are changing culture, you are changing a lot of things." Beirich called those comments "racist." Claire M. Massey, a scholar at the Institute for British and North American Studies at Ernst-Moritz-Arndt Universität in Greifswald, Germany, said Trump's comments were "awfully painful," especially for the United Kingdom, where immigration has played a key role in rebuilding the country after World War II. "England and the United Kingdom wouldn't be what it is today without immigrants," she said. Massey said Trump's comments remind her of the rhetoric coming from neo-Nazis in Germany and Poland. The comments will embolden the far-right in Europe at a time when many European nations are already very diverse. Portuguese Mozambique-born fado singer Mariza is among the nation's most beloved performers. In France, immigrants from the Middle East and Africa have settled throughout Paris and have drawn the ire of the far-right and even some moderates over the city's changing makeup. Then-French Prime Minister François Fillon decreed in 2011 that women were banned from wearing face veils outside of the home except in mosques or as car passengers. A European court later upheld the ban, saying the intent was to unify the country, but not before an outcry by human rights activists. The United States is also going through a demographic shift. The Census Bureau estimates that the country's population will have more minorities than whites for the first time in 2043, a change due in part to higher birth rates among Hispanics and a stagnating or declining birth rate among blacks, whites and Asians. Trump's public life has been filled with controversial statements about immigrants. In the first moments of his presidential campaign in June 2015, he called for the construction of a border wall with Mexico and accused the country of sending migrants who were "bringing drugs. They're bringing crime. They're rapists. And some, I assume, are good people." In January, Trump questioned why the U.S. would accept more immigrants from Haiti and "shithole countries" in Africa as he rejected a bipartisan immigration deal, according to one participant and people briefed on the conversation. In recent weeks, Trump bowed to tremendous political pressure and issued an executive order ending his administration's practice of separating migrant children from their parents when families cross the border with Mexico illegally. Paul A. Kramer, a Vanderbilt University historian who specializes in the politics of inequality in the United States, said Trump's most recent comments were an intentional attempt to ally himself and his base in the United States with the far-right nationalist movements in Europe. "The rising tide of white nationalism is something that he embraces, that he sees himself as participating in and that he wants to encourage," Kramer said.